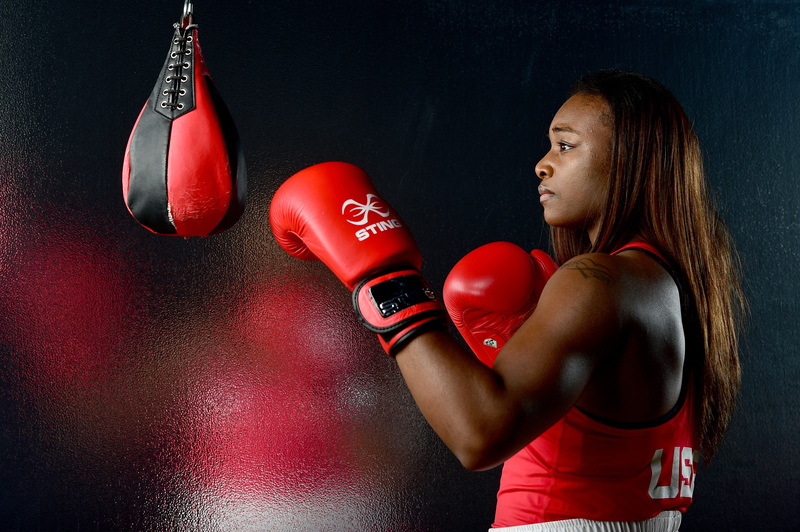 Most Olympic champions heading to Rio for more medals are household names, but boxer Claressa Shields is the Team USA champion you've probably never heard of. It's a little hard to pinpoint why, especially since the reasons for it don't seem to be fair. She grew up in a troubled family environment in a city struck by poverty: Flint, Michigan. Then, after an Olympic win at age 17, the rules of boxing were changed to keep her out of the big fights until she turned 19, essentially benching her for two years. But now she's back and determined to be better than ever. As she starts her quarterfinals match on Wednesday, Aug. 17, Shields is arguably the best boxer in the game. She hasn't lost a single match since the London Olympics four years ago. That win alone was history-making: She was the first American woman to win the gold in boxing. Plus she won three World Championships in the time since. And she did all this while being the first person in her family to graduate from high school — and all before the age of 21. As Yahoo Sports reported, Shields grew up sleeping on the floor. Her father was in prison throughout her life, and she suspected that her mom sold the family's food stamps for drugs. Then there were men who would come to the house to see her mom, but would often molest her. So when she went to visit with an aunt, she begged to stay. Eventually, she went to live with her grandmother. Shields didn't regularly sleep on a bed, though, until she went to live with her first coach, Jason Crutchfield. She started boxing at age 11, when she heard about Mohammed Ali for the first time from her dad, and that he had a daughter Laila who followed in his footsteps. Crutchfield coached her from the beginning straight to the London Games, where he coached from the stands — USA Boxing regulations didn't allow him to be in the ring. All that alone is remarkable. But her challenges didn't end there. On her return, there wasn't the typical clamor for endorsements that newly minted Olympians tend to see. And living with her family was still not possible. She continued to stay with Crutchfield, but then arguments — among them, about whether she was allowed to date — ended their coaching relationship. Then she moved in with her boyfriend, Ardreal Holmes, a former sparring partner at the gym who at the time was also an Olympic hopeful (for him it didn't work out, as he lost in the finals of the Olympic Trials). Not only that, but she also decided to adopt a baby. Her cousin got pregnant, didn't have the money to raise another child, and considered getting an abortion. Shields convinced the cousin to have the baby and let her adopt it. That worked for about eight months, before a disagreement on the adoption terms led to the whole thing falling through. The first couple of days, I just laid around. And then all of sudden, I went to the cafe and you see all these athletes — like even in my downtime, these athletes are still working. Everybody is there to go to the Olympics. It kind of motivated me to start my training early. Now that she's on track to make history again — she would be the first American to ever win back-to-back boxing gold medals — she's increasingly in the spotlight. There's a documentary about her life and what it took to get her to London called T-Rex that is on Vimeo and played on PBS earlier in August. And the endorsement deals have begun; she was featured in the Just-a-Kid campaign for Powerade this year. But more than anything, Shield is fighting for the same people: her family, other kids from difficult upbringings, and her entire town of Flint. "God wants me to spread a message to everybody and to help people that don’t have hope to have hope, and once again, no matter how you were raised, you can be whatever you want to be," she told WOOD, a Michigan television channel. She's makes a pretty convincing argument.